What is your background/experience in permaculture? Permaculture design is one of my greatest passions in life and I strive to weave the ethics and principles through my daily actions. After traveling the world and studying organic and indigenous farming practices in North America, South America, and Asia, I settled down in Northern Thailand at the Panya Project, a Permaculture and Earthen Building education center. While at Panya I served many roles, including the as the Food Forest Manager, Animal Manager and Educational Coordinator. While there I facilitated over 2 0 permaculture workshops, ranging from 3 month apprenticeships to week long introductions to permaculture. I loved living in an intentional community and having the opportunity to share permaculture with people from all over the world on a daily basis. I had the opportunity to present at the first ever Asia Permaculture Convergence in Hong Kong in 2012 on the subject of transforming a monoculture into a perennial polyculture in a tropical monsoon climate. I was so inspired by the experience and connections I made at the convergence, that I followed up by organizing the first Thailand Permaculture Convergence. After leaving the Panya Project I spent 2014 traveling the united states and exploring diverse permaculture communities, from an intentional community in Hawaii to a 1 acre community farm in Berkeley California, to a residential permaculture resource center in Detroit, and a small urban farm in North Charleston SC. I was one of three representatives from South Carolina at the Southeast Permaculture Convergence in Celo NC and the only represntative at the National Convergence in Minnesota. In 2013 I had the opportunity to start a small Permaculture design collective with a group of friends and colleges from the Panya Project, Surplus Permaculture Design. What started as a simple way to create an avenue for our talents has turned into a world wide co-operative that is operating on multiple continents. We chose our name because we believe that conscious design can lead to a world of abundance, and we want to be able to share that surplus of joy through every action we take as people and as designers. Who did you train under? I had the amazing fortune to train under multiple permaculture teachers including teachers such as Christian Shearer of the US, John Champagne from Australia, and Richard Perkins from England. While living at the Panya project I worked with and learned from a divers group of people with permaculture experience in every global climate. Every Permaculture course I have participated in has changed me in some way and facilitated my growth. No matter how many times I listen to a lecture about one of the various permaculture subjects I learn new things and am constantly amazed at the depth and scope of permaculture. 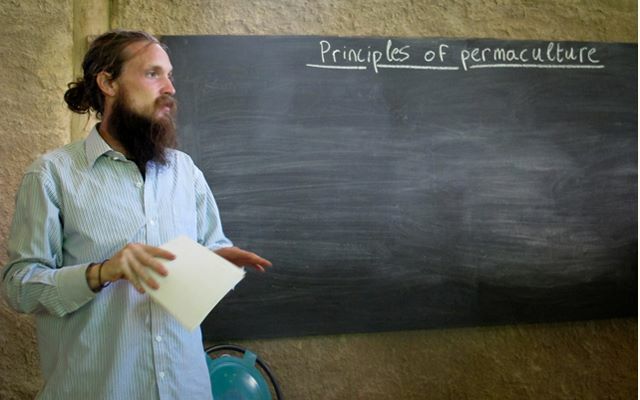 How did you come to permaculture? I got into permaculture because of a strong desire to know how my actions affected the world. I knew there had to be another way of living that brings more happiness. To me there is no more just way of living than sharing space and time with people you care about and growing your own food, building your own home, and creating our own entertainment. What makes you want to teach it? I feel called to teach permaculture and model a different way of living for all of those who have not yet had that experience. Taking my first PDC completely changed the trajectory of my life. Permaculture has given me a framework for becoming the change I want to be in the world. I am passionate about facilitating this human transformation process and creating space for students to step into their true self. For me there is no higher calling than creating the world we want to live in and making it as assessable as possible to people. I am very excited to be offering the first two Permaculture Design Certificate workshops in the state of South Carolina. One of my major goals is to build capacity within the state and help us on that journey towards resilance. What area of permaculture are you most passionate about? I am most passionate about Permaculture as a design science being more than the individual elements we apply. Permaculture design is about creating holistic, closed loop systems that are energy efficient, high yielding, and low / self maintaining. All of the facets of permaculture are equally important, if one single area is not addressed the entire design will lose efficiency. We have every tool in the permaculture toolbox expect for a cookiecutter!